House Speaker Calvin Say opposes selling state land for condos in Kakaako, but said a bill considered yesterday by a House committee would unnecessarily "handcuff" the Hawaii Community Development Authority. House Bill 2555, HD 1 seeks to limit the way the authority proceeds with development of the area bounded by Ala Moana Boulevard, Kewalo Basin, the new University of Hawaii medical school and the ocean. The bill is one of several at the Legislature that react to the HDCA's recent choice of Alexander & Baldwin to develop the 36.5-acre parcel of former industrial land with condominium units, restaurants, shops, parking and expansion of the waterfront park. The $650 million A&B plan was selected in a competitive process completed by the development authority last fall. 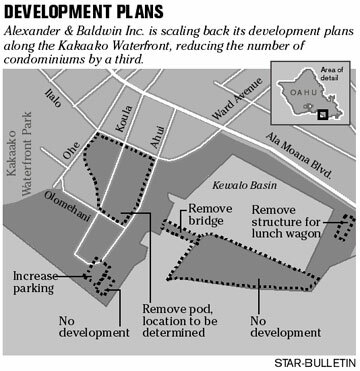 Public outcry to A&B's original plans persuaded the company to scale back its proposal, removing a bridge over the entrance to Kewalo Basin and one of three proposed 20-story condo towers. HB 2555 suggests that an unspecified percentage of the state's Kakaako makai land be in open park use; that no state land should be sold except for public facilities; that any residential projects be limited in size and height; and that an unspecified percentage of residential units be affordable to "Hawaii's working class such as teachers, police officers, and firefighters." The bill would fund improvements for the area with public revenue bonds if the added restrictions cause A&B to drop the project, but does not put a dollar amount on how much taxpayers would spend. Say chaired a hearing of the House Water, Land and Ocean Resources Committee yesterday morning on the bill, where 16 people submitted testimony in support of its intention. About half of those emphasized that they believe Kakaako makai of Ala Moana should not have residential development. Three others called for HCDA to proceed with its plans, and two people praised the agency for its other work in the area. 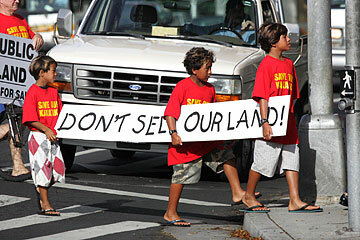 A march last month by Friends of Kewalo's protested development of the Kakaako waterfront area. Three boys carried a sign across King Street near Punchbowl. The bill "is trying to be a compromise" between those who object to HCDA and A&B's plans, and those who believe having a private developer foot the cost of public improvements is a good idea, Say said. Attorney Jim Bickerton said in his written testimony that the bill "is part of a comprehensive plan to ensure that the last precious piece of urban coastline in Honolulu is not lost to private ownership and remains for the use of the public." Real estate analyst Ricky Cassiday urged the committee to "allow a public/private partnership to build homes within a viable community in a relatively barren location" to pay for the cost of public improvements. A&B did not testify on the measure. The committee recessed after taking testimony without taking any action of the bill yesterday.